Beautiful large end unit. Our unit offers comfort and phenoenal views. Look at our photos and video! gentle surf and every evening a sun set so spectacular and incredible a camera is a must. The view of the Crescent Beach stretches south to north with white sands for 3+ miles. The blue waters of the Gulf of Mexico are warm and inviting. Shelling, walking, sand castles or just soaking up the Marco sun are an incredible treat. Tennis courts, hot tub, heated pool and two elevators at your service. Our unit includes 2 full baths, a master bedroom with a brand new king size bed a large walk-in closet, the guest room has two twin beds and the new sofa in the living room opens up into a queen bed. Their is a washer/dryer in the condo, our kitchen is fully equipped, we also have beach towels, two beach chairs and an umbrella. What are you waiting for, a truly great vacation awaits you. Falling in love with Marco Island in 1998, while vacationing, we decided to purchase a condo on the beach to enjoy with our family. We look forward to sharing our vacation home with you. I just can't put into words the experience of seeing the most amazing sunsets in Marco Island. It truly puts life into prospective and takes us away from it all. Whether we take a our chairs, snacks and drinks down to the beach to put our feet in the sand or sit out on the lanai from our condo it feels as though we are viewing the sunset like it is the very first time. We take pride in our responsive and take care in making our guest's stay as enjoyable as possible. $25 parking fee for entire calendar year. New 48" Flat Screen T.V. Free wi fi hi speed internet! Our condo offers everything you need: fully equipped kitchen,(refrigerator w/icemaker, stove, and full size dishwasher, disposal, living room with hd tv., dvd player, cd player as well. Queen sized sofa sleeper and a comfortable matching chair. The dining area overlooks the south end of the beach and pool area. The newly decorated master bedroom has a brand new King bed, 32"flat screen t.v, walk in closet plus a separate tiled bath with walk in shower. The guest bedroom offers two twin beds, flat screen t.v and full private bath. And when, on the rare occasion it rains or gets windy, the lanai can be closed from the elements with the electric shutters. There are plenty of linens, beach and bath towels, dishes, pots, pans, and silverware and glassware. A washer/dryer included in unit. The Best View from 301! Patricia Grace, the host, was absolutely amazing and her condo was perfect for our 8 day/7 night get away to Marco Island. Before we arrived she made contact by both phone and email and set us up for an easy, near perfect check in. Heck, it was perfect! Parking was easy, her instructions were super clear and easy as well. Combo to lock boxes and doors were easy to use and the staff was very friendly. Once we arrived inside the view from her place is breathtaking and the condo was very clean and well stocked with towels, linens, dishes, cookware, etc. We just needed some groceries and adult beverages! Sunsets...amazing with direct access to the beach from the condo only steps away. Beach chairs, umbrellas, and coolers at the ready for our use. Parking for the year only 30 bucks (best value on the island)! We will be back in 2019 just for the parking! Below average internet speeds but the cable had all the football games we wanted to watch and plenty of channels(it's Florida, go outside!). Being an end unit on the third floor gave us 240 degree views of the ocean and we could use the stairs for extra exercise (the 2 elevators were fast and clean). The overall condo was perfect for us, check in a breeze and right on the beach. Four (4) stars for sure, but here's why Ms. Grace gets 5 stars; upon checking in we noticed the central A/C didn't work, blowing hot air (it's 85 and we're from Seattle). We texted her and the very next day she had a professional company replace the entire central A/C unit in the condo and up on the roof (16 stories up!) while we sunbathed on the beach. We had ice cold A/C for the remaining time. I replaced a similar unit years ago at over $10K, I was completely blown away with her quick response, continuous updates via text/phone, and outstanding customer service; consistently following up to ensure we were completely satisfied. We will definitely check her place first for availability on our next trip (we visit S.FL 4x a year) as I'm a 7th generation Floridian temporarily relocated to WA state for work. Great job team Grace! First off Marco Island is a very beautiful place to visit. Location of our condo was wonderful. The sunset was amazing. Owner/Manager of the condo was friendly and very helpful in letting us know different attractions and restaurants on and near Marco. Our favorite restaurant was Snook Inn, Great seafood buffet on weekends, and wonderful atmosphere. If you are looking for a quiet and peaceful destination I would recommend the Sea Winds condos on Marco Island. Thank you so much for staying in our condo! It was a joy to have you both and appreciate your your feedback on your stay! We look forward to having you return! Really enjoyed Marco Island. My husband and my first time in Marco Island. The condo was perfect. Perfect location, perfect size. Would definitely return to this condo. My cousin and I love this unit, especially this March as there was a new king size bed, new covers for twin beds, new chair and couch. Place had everything we wanted--nice showers, real close to beach and pool. Can walk to stores and marina. We have rented this unit for 4 or 5 years and look forward to another few years. We find people very friendly and see Connie/Pat every so often. We are so happy that you enjoyed your stay in my parents condo, we love to hear it. We also appreciate hearing that you were pleased with the improvements we have made. We look forward to having you return again next year! Our stay was great. Dolphins near beach in the am, at noon, and evening. Our place was fully equipped. Showers were awesome, air conditioning kept place very comfortable. Slept like a baby. The keys got us onto grounds, into building, onto beach, and back. Very safe which was nice with kids. Our location made getting around very easy. Plenty of parking. Patricia was a joy to work with. She explained everything well and followed thru. We will be back hopefully very soon!!!!!!!!!!!!!!!!!!! 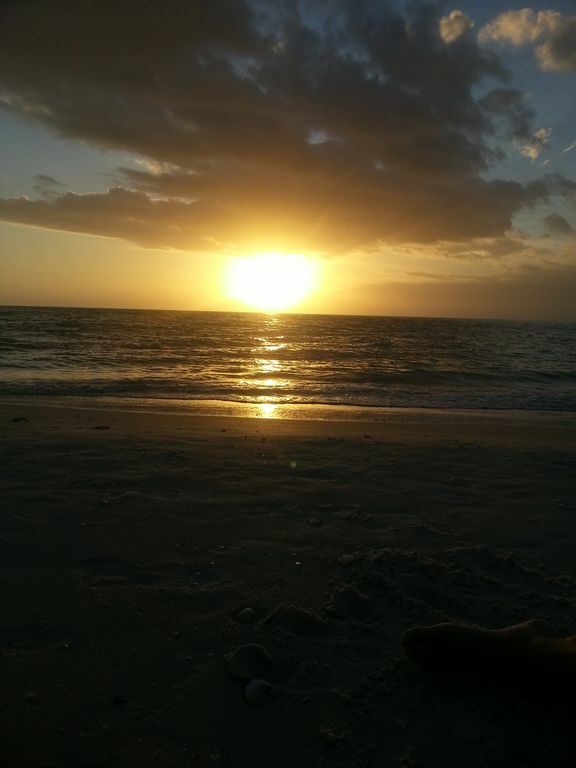 You can't beat Marco island for beach, sunsets, shelling and nice quiet family vacations. This is a good-sized, well equipped unit with lots of space and a great screened in porch so you don't have to worry about critters or the safety of little ones. The building has a nice pool and hot tub (scalding hot in fact). And you are just a walkway to the beach. The owners were very pleasant to deal with. We had a mishap with the key (our fault) and she was available on the phone immediately and was able to remedy my problem right away. Marco A bird sanctuary is a short drive over the S.S. Jolley Bridge. A $30 parking fee will be charged at the front office. This will cover a year while staying at the Sea Winds.